Keratoconus in phase I, II and III can be treated with a minimally invasive treatment like INTACS or MYORING. Thanks to special rings made of a plastic material that are inserted inside the cornea, the cornea itself assume a more regular shape. Keratoconus treatment with this procedure improves vision and contact lenses tolerance. The advantages of this surgery are its reversibility (it is possible to easily remove the rings, bringing everything back to its original status), a quick vision recovery, the absence of pain during post-op and a quick overall recovery. INTACS are rings made of a plastic material that are inserted in the peripheral part of the cornea: they flatten and regularize the central part of the keratoconus. 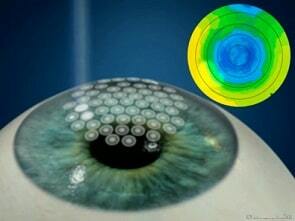 The MYORING ia single ring that is placed in the central part of the cornea and cures corneal irregularities. It is an innovation in keratoconus treatment that is still not that widespread among italian cornea specialist. The corneal topography is truly important when choosing between INTACS and MYORING in case of keratoconus. Want to be free from keratoconus with Intacs o Myoring?